Outside of the occasional bus or airport shuttle, I traveled around New York mainly via the subway. But being a designer, I was reminded again just much I enjoy my job. And how much I appreciate good design. Sometimes we forget just how much good, well-thought-out design is a part of our every day lives. One could complain that obnoxious advertising messages are bombarding us at evert angle (which is true), but so is good design. You should hug your graphic designer next time you see him or her. I thought about the daunting and overwhelming work that a designer had to put into “designing a city.” Can you imagine the incredible task of breaking down and designing a transit system for New York? To graphically and accurately make sense of the complexity of a city? (Try saying that sentence five times.) I always say that probably half of my job is problem solving, whether it be logistically, mentally or graphically. Visual problem solving. Visual solutions. Sure, a city is build on a grid and a common framework, but that’s just the beginning. You have to consider so many systems–from colors, fonts, signage, language, diagrams, icons, standardization, and other simplifications. Look how essential metro maps are to your experience. You can thank designer Harry Beck. Beck mastered the art of communicating a complex system into a minimalistic diagram when he designed the London Underground map in 1931. Pushing geographic accuracy aside, Harry laid out underground routes using beveled edges turning at clean 90- and 45-degree angles. London’s transit map set the bar for succeeding maps around the world. It combines functionality with beauty, and survives as an inspiration to designers today. Today, NYC’s subway is one of the oldest and most extensive public transportation systems in the world. Over the years, several artists have taken a crack at redesigning the NYC transit map. Perhaps the most prominent and most talked about design is that of Massimo Vignelli. 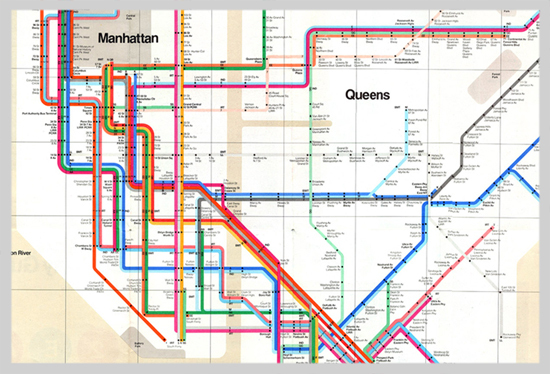 Like Beck before him, Vignelli simplified New York’s subway system into a clean graphical diagram, using bold bands of color that turned at 45- and 90-degree angles. The subway map was published by the MTA between 1974 and 1979. Still, the over-simplification of geographical elements left many New Yorkers confused, so the MTA replaced Vignelli’s map with a more traditional, typographic map that persists in revised form to this day. It’s colorful and beautiful in it’s simplicity. It’s an ongoing process, as these maps become a graphic breakdown of an entire city. Like the city, its people and its technology, they are constantly evolving and hopefully getting better.